November | 2013 | E-verything! What’s that outside my window? I was working at home yesterday with the window open as it was a beautiful Spring day. I needed to leave the study for some reason and so went to close the window. As I pulled the window shut I looked down, and to my great surprise saw that Jurassic Park had come to call. There on the ground, looking up at me, was a one metre long dinosaur! Of course it wasn’t really a dinosaur but a very large lizard. Of course once I saw the dinosaur I immediately forgot whatever I had been intending to do (I still can’t remember) and rushed to grab my camera. However by the time I had picked it up our visitor ws strolling round the corner of the house. I flew into the next room only to see that the lizard had walked under the “gate” where there was a narrow gap and into the fenced back yard area behind the house! An opportunity not to be missed, so I headed rapidly outside camera at the ready. Numerous pictures later it was time to chivvy our visitor back out of the back yard. 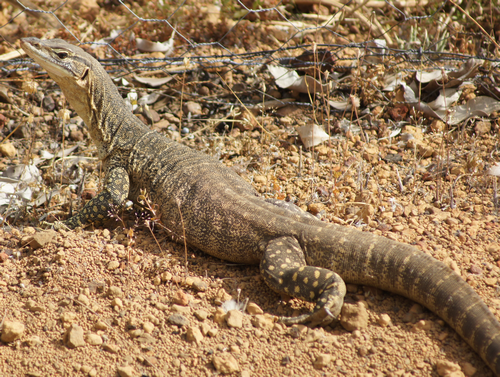 A lizard that size living in the back garden is not to be contemplated – too risky for us and him/her. 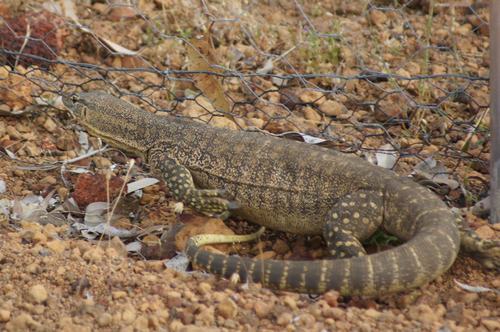 Our visitor, by the way, was a “racehorse goanna” so called because of their speed when they decide to leave in a hurry. 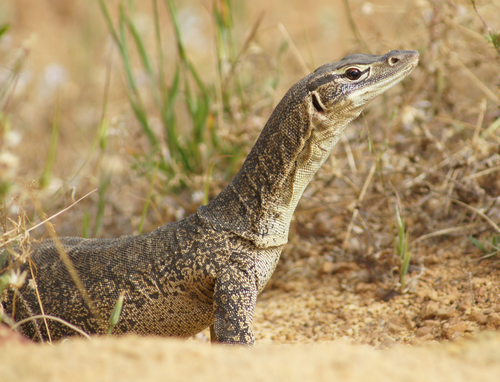 Otherwise known as a “Gould’s monitor” Varanus gouldii. I take delight, daily that I live in such an exciting place with spectacularly coloured birds, dinosaurs and kangaroos outside my window. Yesterday’s visitor will definitely find a space on the “Hart Calendar for 2014” that we make every year from pictures taken around the house and block.